You're right off the lift line, so you're not at the mercy of the shuttle schedule. Even the occasional winter day is warm enough if you stay in your ski layers. Gather over board games, or just sit fireside with a book. The lodge-like lounge area is like a second great room. Enjoy some peace and quiet while the rest of your crew shops for Breck-emblazoned hats and t-shirts. Do one last gear check on the kids once you get to Snowflake Lift, just steps from the resort. Head downtown for shopping, dining and entertainment on Main Street, a 4 minute drive from the resort. Set a new family hiking record at Spruce Creek Trail, an 11 minute drive from the resort. Brush up on your game at Breckenridge Golf Club, a 10 minute drive away. Tucked in among the trees, the ski-in/ski-out Riverbend Lodge is right next to the Snowflake Lift. Head for the easy Twister run (pretty fierce name for a green! ), which will take you to your choice several chairs for access to more of the mountain. Make your plan inside the cozy lobby/lounge before heading out – it’s hard to point to runs on the pocket-size map with those big mittens on. When you’re ready to call it a day, follow the Four O’Clock run down and make your way inside for a DIY après ski. See if you can round up some takers for a trip to the outdoor hot tub, and go for it, comparing goose bumps the whole way back. Thinking you want to leave dinner to the pros at one of the local restaurants? The complimentary on-call shuttle will take you anywhere in Breckenridge. For summer months, bring or rent bikes – the trails are right outside – and plan on low-key dinners hot off the grill. Looking for local recommendations or help booking excursions? Riverbend guests have access to the 24-hour front desk, bell service and concierge at the nearby River Mountain Lodge. Nestled in the pines, these comfortable one- and two-bedroom vacation condos welcome you back from your mountaineering adventures, whether you spent the day on mountain bikes, skis or snowboards. Gather everyone around the table for après snacks and sips, a tradition you may decide to continue on weekends at home (après lawn-mowing or après closet-organizing, anyone?). Full kitchens are equipped for “real” cooking, but there’s certainly no shame in convenience food after a day on the slopes – the freezer’s your friend. Toss a salad or roast some veggies to go with that (thankfully) pre-assembled entrée and you’ve got dinner. Wind down in front of the fire with popcorn and a movie, then get out the trail map to plot the next day before everyone hits the hay. 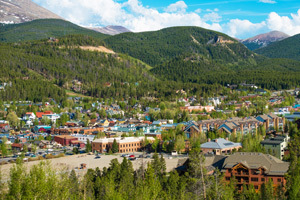 Breckenridge started as a mining base camp back in the day, and has blossomed into a full-fledged year-round resort without losing its historic charm. Browse the 500 or so boutiques, galleries, bars and restaurants along and right off Main Street, or narrow it down by asking locals for the “best of.” Keep your Go-Pro handy – you’ll want video of the Alpine SuperSlide, TenMile Flyer Zipline, Bungee Trampoline and Gold Runner Coaster at the Breck Summer Fun Park. Take your crew fly fishing, river rafting or rock climbing. And book tee times at the nearby Keystone Ranch or 27-hole Breckenridge Golf Club, the world’s only Jack Nicklaus-designed municipal course. If you’re here to ski and ride, there are groomed blues galore – but Breckenridge also has a T-bar up to the open terrain and bowls south of Peak 9 and 10. Or check out the less-crowded neighboring Keystone, with its top-ranked A 51 terrain park. Got an expert-level crew? Do the double black diamond Imperial Bowl topping out at almost 13,000 feet, just to say you did. - There is no front desk at this property. Check-in for this property is based at a different location: Main Street Station, 505 South Main Street, Breckenridge, CO 80424. To make arrangements for check-in please contact the property ahead of time using the information on the booking confirmation.